Our Pre-Service Training (PST) will last about nine weeks and then we will be sworn in as Peace Corps Volunteers and leave for our permanent sites. There are other training events during the following two years, but for the most part, after PST, we are done training, and will be at our site doing good things, hopefully. 6 am, rise and shine. It is a little chilly outside since we are entering the winter here below the equator. Since it is chilly outside, it is chilly inside because there is no heat or insulation in the Botswana homes. We warm water in a kettle on the stove to use for washing our faces (no hot water). We dress in clothes that I washed by hand and dried outside on a line last Sunday (no washing machine or dryer). We eat our breakfast and then have to wash the dishes by hand (no dishwasher). Everything is a little different here. I like cereal for breakfast, with milk. In Botswana milk is sold in boxes that do not require refrigeration (until opened). These boxes hold about 1 pint and I have not gotten the hang of opening them yet without spilling milk. The milk is all whole milk; you can’t get 1% or 2%. The bread we get comes in loaves that are not sliced, we have to slice it ourselves to make a sandwich. I make four slices because Tish will want to make a sandwich for lunch. I make my PB&J for lunch. There is no jelly, and the jam comes in a tin can. So dressed, with faces washed, breakfast eaten, dishes washed, lunches made, and sunscreen applied, I pack my backpack. The backpack contains a bottle of water, our lunches, our school supplies, my laptop, a rain coat and my umbrella. We have to be at the Kgotla for Setswana lessons at 8 am, so we set off at 7:30. We have to walk everywhere. 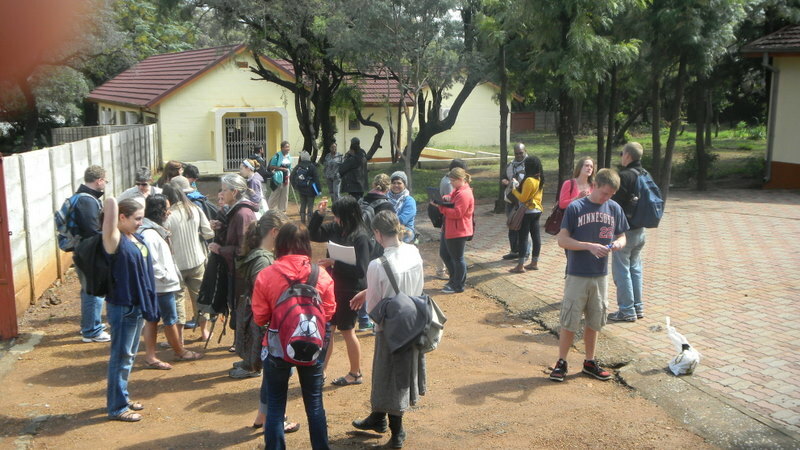 First we walk to our Setswana class which is held at a building at the Kgotla, and then when that is over at noon, we walk to the educational center where the rest of our training occurs. We walk about 2.3 miles each way. Today we also walked to the grocery store so our total hike was over five miles. If the sun is out I am usually wearing the hat which my sister-in-law gave me for Christmas (Thanks Kim), and my sunglasses. Tish wears her hat as well. If it is raining we pull out the raincoat and umbrella. Since we have been here we have been caught in the rain a few times. Our walk takes us on a very circuitous route, mostly on rocky dirt roads or paths. We pass the nearby Botswana homes that are typically small and made of concrete. They usually are surrounded by a fence of some kind. 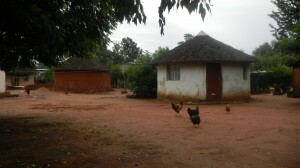 Within their fenced in area there is usually the house and perhaps an outbuilding and latrine. At least half the houses have thatch roofs. Some have small gardens and chickens run free everywhere. There are a lot of small kids and they usually call out to us. We are very different than most of the people they see. Some of them had never seen a white person before we moved into the neighborhood. We are sometimes called “Lekoa”, which loosely translated means “white person.” We answer them in Setswana and say “Dumela” (hello). 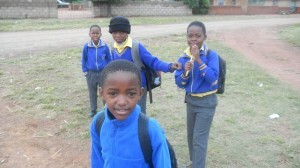 We pass a lot of adults too, and school age kids in their uniforms walking to school. In Botswana it is important to greet everyone. If you don’t greet them you are indicating that they don’t exist for you, and that is rude. When in a place with a lot of people, like a busy city street or a grocery store, practicality takes over and greetings are often skipped. On the dirt roads and paths of Kanye we greet everyone we see. Occasionally they will want us to stop and speak more and we will try out the little Setswana we know. Usually they will understand us, and will be smiling. They are probably amused at our awful pronunciation, but we are pretty sure they appreciate the effort. We spend about four hours of the day learning Setswana in very small classes, taught by two Language and Cultural Facilitators (LCF). There are only seven trainees in our class and we have two teachers. We are learning a lot, but after only three weeks have only scratched the surface. We also learn the language from our host mother around the house, though not as much as we would like – she speaks perfect English and speaks it all the time. In the morning we say, “Dumela Tebogo”, and she replies, “Good Morning”. 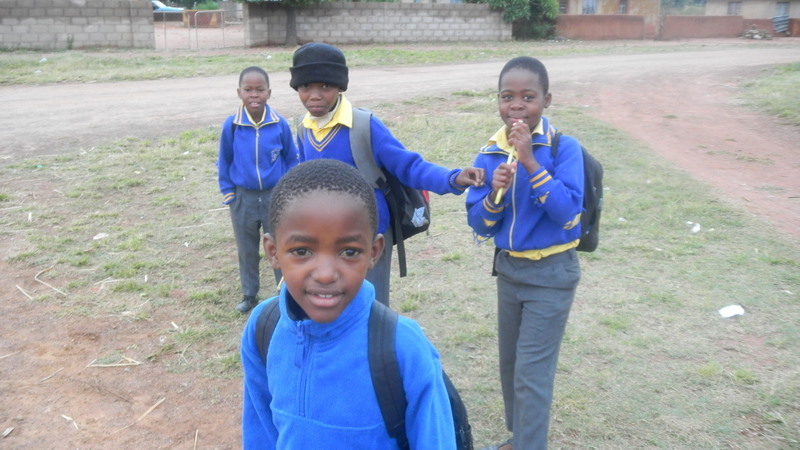 Our LCF’s are Tiro (short for Tiroyamodima Mookodi), and Sebbie. They are both from Botswana and speak excellent English and are great teachers. They don’t just teach Setswana, they are also available to answer cultural questions. 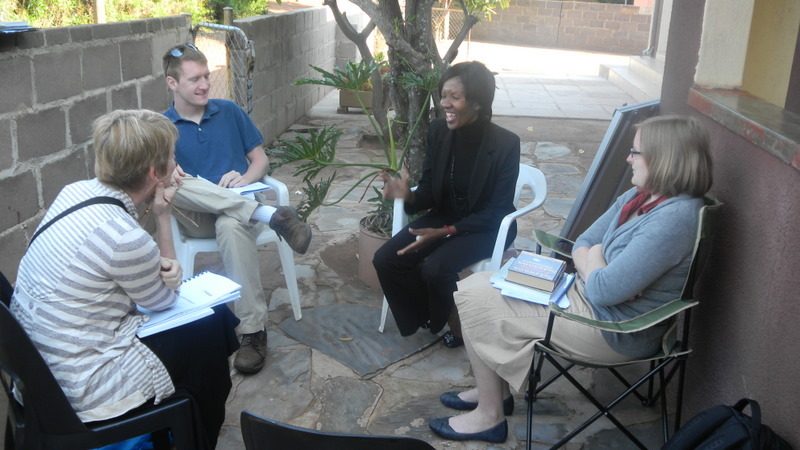 Regarding the Peace Corps staff, I was surprised that except for three positions (Country Director, Program Director, and Finance Director); all of the Peace Corps Botswana staff are from Botswana. This apparently is the Peace Corps norm all over the world, and it seems to work just fine. Our staff has excellent credentials. Many have post graduate degrees and some even got them from institutions in America. Setswana lessons over, we make the hike to the education center. When we arrive we have about 45 minutes before classes start and it is time to eat our lunch. We sit in clusters of people, eating, chatting and working on our laptops. There are monkeys that run around the grounds and we are entertained by them. There are a few dogs and cats walking around hoping for food. We talk with each other about Setswana, the training, back home and how it is where we are living. The trainees are all very close to each other and we are becoming like a family. At last count there were 38 volunteer trainees counting ourselves. We started with 40, in Philadelphia. So far we have only lost two. One trainee was with us in Philadelphia, and even rode the bus to JFK, but did not board the plane for Africa; he changed his mind and did not come along. We had only been with him for two days, and so we had not all gotten to know him. Last week another trainee received word that his mother was very ill and he had to return home. Depending on how long he has to be back home, there is a chance he could come back and be part of our group (Bots 10). We all hope so, he had been with us for over two weeks and that was more of a loss. During our conversations we have learned that not everyone is as comfortable as we are in their home stay house. Some trainees have to walk further than we do, and some don’t have water inside the house and have to haul it in from a spigot in the yard. A few trainees have to do their business in a pit latrine outside the house, and some share their house with as many as 10 people. Lunch done, we resume training. 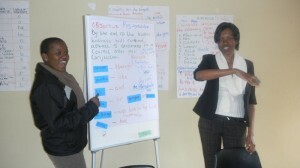 Today we started learning about PACA (Participatory Analysis for Community Action) which is the basis for the Peace Corps capacity-building approach to development. As taxpayers who support the Peace Corps, you can feel very good about what the Peace Corps does in the world. More on that later. Classes are usually over about 4:30 or 5 pm and we start walking home (another 2.3 miles, mostly uphill on the way back). We arrive home around 5:15 or 6 pm. We relax and then read and/or study for an hour or so, and then prepare dinner. We eat with Tebogo at a table in the kitchen. Then after doing the dishes I take the bucket and go get some hot water for our baths. Bucket baths finished, we are usually in our room by 8:30 or 9. There is no American TV or Internet to entertain us, so we read, study or talk with each other. I really am enjoying this simpler life with fewer distractions, we are usually asleep by 10, often by 9, and that is a typical day! This entry was posted in Peace Corps, Pre-Service Training and tagged Botswana, Mobley, Peace Corps. Bookmark the permalink. I am enjoying your wonderful story-telling. You definitely have the knack. You have found your career beyond IT. I’m sure you will do wonderful work there. My wife Anne and I have just started the PC application process so we have enjoyed your blog on your experiences. Lots of great tips that we appreciate. We also started ESOL tutoring based on your experience and the PC suggested we start Spanish lessons to get beginner proficient which should help our placement. Thanks again and keep up the great blog. I may have some questions later on how you get your website started, if we get that far! Hey Marion! Excellent story, and I can’t wait to hear more about the good work you do once you get trained up. Back here in the states, you have a new great nephew, Graham Elliott Howard! You can check pictures on our blog if you get a chance. My husband and I have also just started the application process. I just stumbled upon your blog and I love it! It is wonderful to get to read the thoughts of a couple who are serving in the Peace Corps right now, who literally just went through all of the steps to get there. I echo Chris, you are a great story teller! And I love your positive attitude. My husband and I are 26/27 and at a point where our thoughts are, “Ok, decision time. Peace Corps now or have kids now?” We grew up in Colorado, got married while in college there, and although I wanted to join the Peace Corps upon graduation he did not. Now we have been married for five years, I have two master’s degrees, in economics and finance, and we live and work in Washington, DC. I work as an economist for the government on a team that estimates GDP, while my husband manages a Starbucks store. I am open to doing whatever job needs to be done in the Peace Corps. Ryan is also open, but hopes to get away from a desk and outside. His degree is in Organizational Management and all of his experience is in management, so I do not know what the chances are that he will be placed “outside.” We are also looking into graduate programs (in the physical sciences) that include Peace Corps Service as part of the program. Sorry about the lengthy response but I hope to stay in touch with you while we travel along our journey (and you, too, Ken & Ann). I’m excited to hear more about your training and service in Botswana! So enjoying reading about your experience! Hard to believe you are really there! Know that you two are constantly in my prayers, that God will continue to guide and protect you. Give you joy and meet all your needs (toilet paper especially!!) Wish I could send you a 2 liter of Coke (though I did see it in one of your pictures) and some Trisket Crackers and good hummous or dip! !